I try to buy Goalscape Desktop for my work (education), but can only pay with creditcard. Problem: my organisation owns debitcards only. We don't have paypal too. Is there a way to transfer the money (60$ or €48,78) in another way. For example transferring the money to an accountnumber? You can use any major credit or debit card (Visa, MasterCard, etc) to purchase Goalscape. 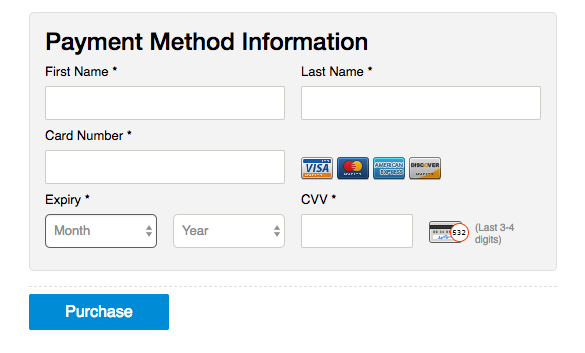 Just select the product you want on our Plans and Pricing page, then in the Payment Method Information section of the Checkout page, insert the long (16-digit) number, the expiry date (month and year) and the CVV security code (the 3-digit code on the back of the card). See the attached screenshot. If that does not work for you please post again with a description of what happens when you try to enter those details – screenshots would be helpful. I have made your discussion Private so your details will remain confidential. PS Note too that you can easily set up a PayPal account, using your debit card or bank account as the registered payment method.